A dank fog creeps between trees that reach with skeletal claws towards a darkening sky. Brittle leaves clatter together in a chill wind that moans over chimney-tops and hammers at windows well-shuttered against the night. Are those bats that flit across the moon and cast shadows over unlit thresholds? Or something worse? Hold each other tightly and keep your doors barred, children, for something wicked this way comes. * In no particular order I present some of the scariest literary witches. *Author’s note: I am well aware that not all witches have warts or fly on broomsticks, and (to quote Xander Harris) “witches they were persecuted. Wicca good and love the earth and women power and I’ll be over here.” In the spirit of Hallowe’en I am choosing to ignore this fact. Bellatrix, complete with meth teeth. Voldemort’s right hand woman and a die-hard Death Eater, Bellatrix is deeply evil. Sent to Azkaban for torturing Neville Longbottom’s parents until they went permanently insane, Bellatrix is also responsible for the curse that kills Sirius Black, her cousin and Harry’s godfather. 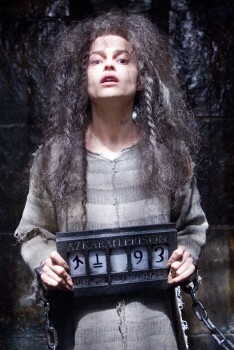 Dumbledore describes her as “…dear Bellatrix, who likes to play with her food before eating it.” Yikes. After seducing Howl by appearing to him as a pretty young woman, the Witch puts a curse on him so that the moment he falls in love he will have to return to her side. Later, she curses young Sophie so that she turns into an ancient crone who cannot speak of the spell to anyone. I wouldn’t want to get on this curse-happy Witch’s bad side!